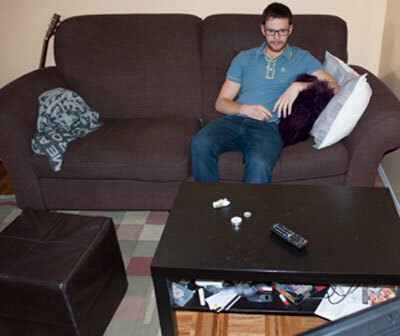 Matt Aussel, 24, has been living in his roomy basement suite since October 2013. The two-bedroom suite is shared with a roommate and is rented at $1,000 per month plus the cost of utilities. Aussel, who is a student of the film studies program at the University of Calgary, says that the basement suite is convenient for the time being. 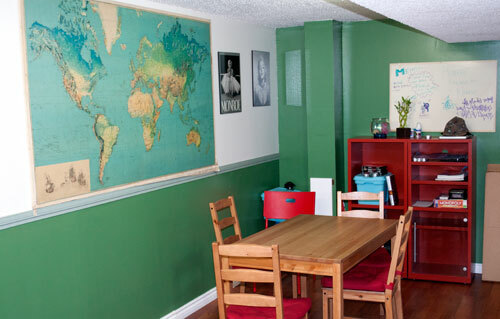 The suite is located in the quiet, inner-city community of Bowness. “Some parts of the neighbourhood are not so nice,” says Aussel, but he says he lives there because it’s close to school and amenities. The suite boasts a full kitchen plus separate dining and living spaces. Aussel says that he doesn’t struggle with storage as there are two small storage rooms — one even features an in-suite laundry pair. Aussel doesn’t know whether the basement suite is fully legal, but assumes that it is.